By Melissa 1 Comment - The content of this website often contains affiliate links and I may be compensated if you buy through those links (at no cost to you!). Learn more about how we make money. Last edited September 6, 2015 . By now, you’ve likely heard the news that Ashley Madison, the site that offered married individuals the chance to sign up for affairs with other married individuals, was hacked. Ashley Madison’s client information was leaked, and within hours, Josh Duggar, who has already faced a significant scandal this year, was identified as someone who had an Ashley Madison account. I won’t talk about the morals of the issue or hypocrisy when it comes to Josh Duggar. I’ll admit, those were my first thoughts (along with disappointment), but my next thought was, how could his wife, Anna, not have known? Of course, we’re not privy to their relationship. Maybe she did know. But I’m going to assume that she didn’t. Yet, Josh spent almost $1,000 on his Ashley Madison account, and I’m sure his costs didn’t end there. He likely paid for hotel rooms, perhaps gifts, dinners, etc. Did Anna not notice the money drain? Is she not involved in the family finances? I had a friend in college who found out in adulthood that her father had had an affair for over 20 years. He’d even had a child with his mistress, and yet his wife was none the wiser because he paid child support through his business account, which his wife was not privy to. Years ago, couples got married, and yours and mine became ours. All accounts were shared. Now, however, many couples keep separate accounts. There’s nothing wrong with that, but doing so does seem to make it easier to keep financial secrets, whether it be signing up for an Ashley Madison account, gambling, shopping too much, etc. While I wouldn’t recommend stalking your partner online looking for infidelity, there are ways you can naturally include safeguards in your financial life. These safeguards won’t stop cheating from happening (because if someone is determined, he or she is going to find a way), but they will help the other party know more quickly that something has gone wrong in the relationship. Share bank accounts, credit card accounts, etc. Keep everything together if you can. By doing so, you’ll know if your partner has spent an unexpected $500 or $1,000, and you’ll be able to talk about it. For so many couples, only one person handles the finances. I know it’s easier that way, but ignorance is NOT bliss. If you each have a role in the finances such as one person handles the investments and one person pays the day-to-day bills AND you regularly have budget meetings together, you’ll not only argue less about finances, but you’ll know what your partner is doing financially, and she or he, you. My husband originally set up our Amazon account so he could sell his used college textbooks. All Amazon notifications go to him through e-mail. In the last five years or so, I primarily use the Amazon account, but I never changed the e-mail. This helps keep us both accountable. If I purchase anything, he gets an e-mail. I’m frequently on the site, so I can easily see if he’s purchased anything by our order history. Having this built-in accountability generally works fine. It only gets tricky when I’m buying him a gift. Then I just ask him not to open the e-mail, which, luckily, he does. Experts recommend pulling your credit score and report once a year to watch for identity theft (though I’d recommend doing it two or three times a year). This is another good way to make sure that neither you nor your partner have opened up credit card accounts without the other knowing. 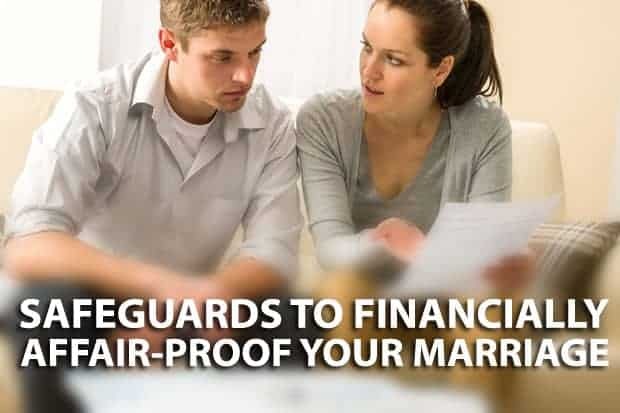 Taking the precautions listed above can help not only keep you alert if your partner starts becoming financially errant, whether that’s because of a shopping addiction or an affair or some other reason, but they can also help the two of you remain on the same page with your finances. What is your opinion? Do you agree with these tactics to protect your financial life together, or do you think some of these strategies are an invasion of privacy. 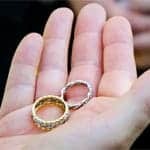 Divorce is becoming more common. 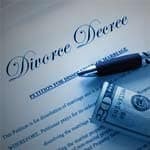 While reconciliation is usually the best option, there is still hope for recovering financially if a divorce goes through. Financial advisor Clint Gautreau points out that there are 3 main areas of finance that you should talk about before tying the knot. Last Edited: 6th September 2015 The content of biblemoneymatters.com is for general information purposes only and does not constitute professional advice. Visitors to biblemoneymatters.com should not act upon the content or information without first seeking appropriate professional advice. In accordance with the latest FTC guidelines, we declare that we have a financial relationship with every company mentioned on this site. I definitely think couples need to work together on finances to avoid this kind of thing. And I think that, as long as both people agree, it’s not an invasion of privacy. If you’re doing it without your spouse/partner’s permission… That’s a problem. That said, I also knew women on a collecting board I belonged to who would post about stuff they were hiding from their husbands so the guys wouldn’t figure out how much they were spending. Uh… what?